By working to be more sustainable you will be supported by companies and individuals who are also working towards being green. You will be able to report to sponsors and to the media that your festival is working to have only a positive impact on the community and environment. Your festival can even receive recognition in the form of an award for your efforts. Use your sustainable event to your advantage and have a positive impact while doing it! 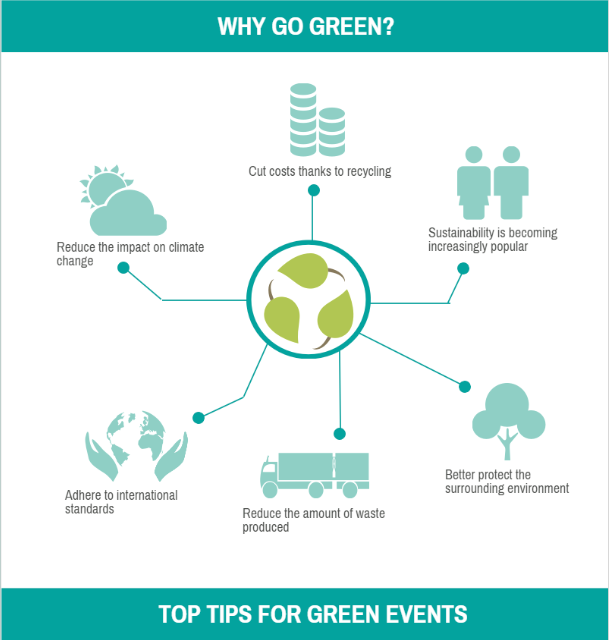 Green Events Can Save Money! When planning a green festival it may surprise you that there can actually be financial benefits involved. Remember that you will be focusing on reusing and buying less which saves money, you will be generating less waste which reduces disposal costs, and you will be reducing your energy bill by being energy conscience! One specific example is that something as simple as collecting name badge holders for reuse at an event of 1300 attendees can save approximately $975 for the event organizer (Source: www.conventionindustry.org). Music Fans Actually Want Green Events! Green Events Can Save Resources! Using recycled materials, recycling materials used, reusing items and reducing materials used can significantly lessen the environmental impact of an event. For example a five day event serves 2200 people breaks, breakfasts, lunches and receptions using china instead of plastic disposables, it prevents 1,890 lbs. of plastic from going into a landfill. That’s nearly one tonne! Another example is by not pre-filling water glasses at banquet tables during three days of served lunches for 2200 attendees; 520 gallons of water can be saved (www.conventionindustry.org). This image is reproduced from losberger.co.uk.